Rotary International are partnered with the Bill and Melinda Gates Foundation to provide medicare and aid to those in need. Since 2014, the Arvada Rotary Club has participated in the Guatemala Literacy Project. The Rotary Clubs of Guatemala La Reforma and Calgary, Canada are thrilled to announce that the Guatemala Literacy Project (GLP) Global Grant for the 2017-2018 Rotary year has been approved by The Rotary Foundation. The total amount is $694,092, the largest grant to date for this wonderful project that benefits so many people in Guatemala. 137 clubs, 25 Rotary districts, and a $150,000 match from the government of Canada contributed to this Global Grant, which will provide the gift of literacy, education, and training to more than 10,000 indigenous children and teachers in rural Guatemala. While this grant will have an enormous impact, it will not end poverty and illiteracy in Guatemala. 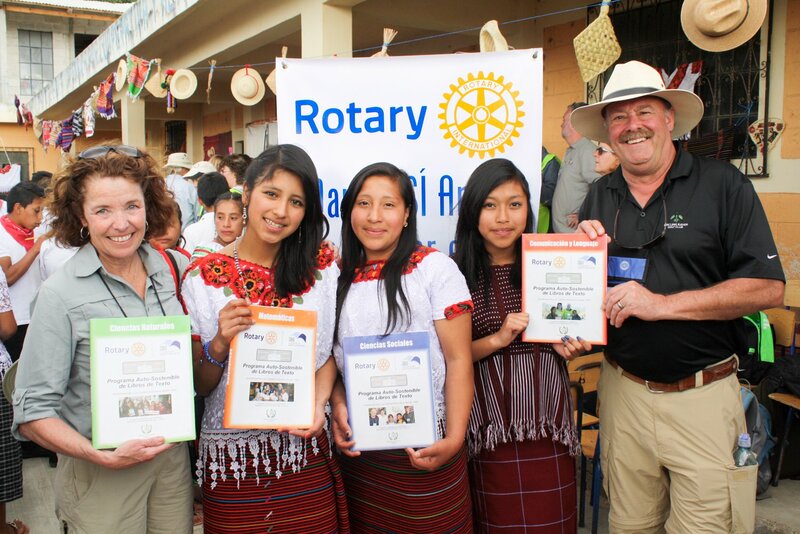 The Arvada Rotary Club continues to support this sustainable program which brings literacy, textbook, computer, and youth leadership programs to schools in the regions of Guatemala. Through the Rotary Foundation matching grant system, our club funds allow us to support a large scale international program. More information is also available online at www.guatemalaliteracy.org. Rotary Youth Leadership Awards (RYLA) is a life-changing leadership training program for young men and women. Leadership skills and principles are learned, developed, and enhanced in an atmosphere of trust and respect. The purpose of these conferences is to encourage and assist current and potential youth leaders in methods of responsible and effective leadership. RYLA Conference (held at YMCA of the Rockies, Estes Park, CO) Applicants must be current high school sophomores or juniors, and must be able to stay all 5 days of conference. Young RYLA Camps (held at Ponderosa Retreat & Conference Center, Larkspur, CO) applicants must be a current 7th grader to apply, and must be able to stay all 5 days of camp. RYLA Plus Camp (physically-challenged teens) is held at Easter Seals' Rocky Mountain Village, Empire, CO. If you know of anyone who may be interested, they can learn more about these opportunities at http://www.rmryla.org or have them contact Linda Kay Nedved, msesqlkn@aol.com. Established in 2002, AWRSAY is a collaboration of 8 service clubs (including Arvada Rotary), businesses, city governments, the faith-based community, public and private schools, foundations and Red Rocks Community College. Its purpose is to extend a helping hand, through scholarships and grants, to students who have undergone significant hardship. Each year AWRSAY awards approximately 16 RRCC scholarships to graduating seniors in the Wheat Ridge and Arvada areas. The organization also provides $200 grants to approximately 25 students in grades 6-11 to help pay for summer activities such as leadership camps, sports camps and music camps. AWRSAY is funded through annual grants by the organizations listed above. Representatives from these same organizations provide the leadership and labor needed to keep AWRSAY going. Another major source of funding is the annual Get it Done Breakfast, held at the Arvada campus of Red Rocks, which raised over $23,000 this year from table sponsors (including Arvada Rotary), area businesses, and attendees at each table. This function gives attendees a chance to hear past scholarship and grant recipients talk about what AWRSAY has meant to them in meeting their educational and career goals. Santa House was created about 8 years ago by some of the same community leaders involved in AWRSAY to provide toys and clothing to children up to 12 years old who might otherwise not experience a joyful Christmas. It is open for 2 weeks in December to families whose children are eligible for free lunches in Arvada and Wheat Ridge schools. Most of the organizations which support AWRSAY also provide money and volunteers for Santa House. Arvada Rotary provides volunteers to transport toys from a warehouse to the location of the Santa House--and back to the warehouse at the end of the event. In addition club members donate, out of pocket, a significant amount of cash every year which is used to purchase more toys & make sure there continues to be a good selection available for its "clients" every day. Finally, the club provides volunteers to work at the Santa House during the days it is open for business. This year's Santa House will be located at a site between the vacated Hobby Lobby and the Target store on the southwest corner of 80th & Wadsworth Blvd. Arvada Rotary participates in AWRSAY and Santa House because it's signature goal is to enhance the educational opportunities of the youth of our community!